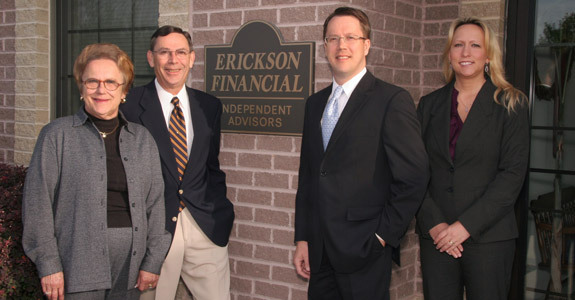 Vaughn Erickson founded an insurance practice in 1977 as a career agent with Lutheran Brotherhood. At his side his wife, Joyce Erickson, supported him from the home front and later joined the practice as the receptionist. David Erickson joined his father and Lutheran Brotherhood in 1992. In 2002, they joined First Heartland Capital, Inc., and established an independent advisory practice. Rose Mellott was hired in 2008, as the Client Services Team Leader. Rose manages a variety of activities that keep the office running as efficiently as possible. Amber Crouse, our Client Services Assistant, was hired in June 2017. Amber assists in maintaining Erickson Financial's high level of service and attention to our client needs. Now with a combined 65 years of experience our firm manages over $90 million in client assets.